Heavenly blog! : No. 1596: When the Norwegian state is conducting a Christian prosecution against me as they did with Norway's great son Hans Nielsen Hauge, I'm glad you agree with the fact that we get paid all the fines they impose to keep the word of God! No. 1596: When the Norwegian state is conducting a Christian prosecution against me as they did with Norway's great son Hans Nielsen Hauge, I'm glad you agree with the fact that we get paid all the fines they impose to keep the word of God! 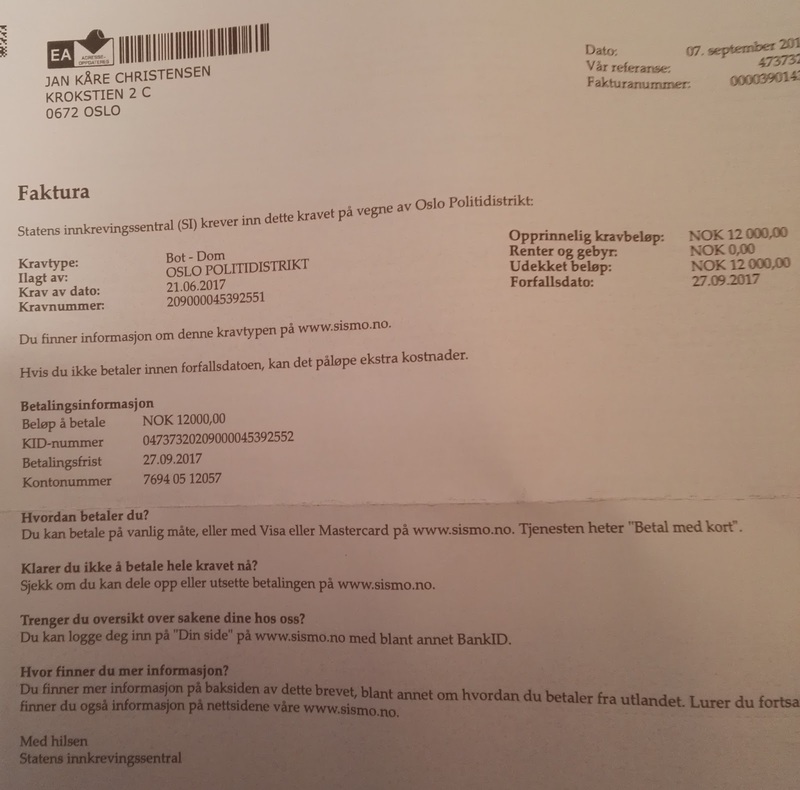 When the Norwegian state is conducting a Christian prosecution against me as they did with Norway's great son Hans Nielsen Hauge, I'm glad you agree with the fact that we get paid all the fines they impose to keep the word of God! Together, I received a cure for proclaiming a reprieve as a hesitant sin for Christians to do. It is contrary to the word of God, even though they have made a judgment against me and the heavenly blog. Am I glad that there are so many who are in charge and we have now paid all fines given to me to keep the word of God. (picture shows the claim that is now paid). Thinking of our brother Hans Nielsen Hauge who have walked the same path as me 200 years ago with harassment and persecution. The quote on the monument at Hauge's birthplace in Tune Østfold says it all: "I have sworn to the Spirit of God obedience and he has helped me to be my intent faith." Here is an article about our dear brother Hauge, read yourself. It is much of the same of what I experience, but God be praised, Jesus won an eternal victory! 11 years in prison, a health completely destroyed by the Norwegian state and another! This I have not gone through, but now received a fine of $ 12,000 to keep up the word of God as they have distorted it all. I thank you and God for your generosity, intercede and you stand with me and the heavenly blog! I have obeyed the Spirit of God, and he has helped me to become my faithful faith! Was there something that featured Hans Nielsen Hauge and all his books, so it was the authority of God's Word. There has recently been a negative focus on Christians who take the Bible seriously and believe in the word of God. Most people who know a little about the history of waking and Norway's history must acknowledge Hans Nielsen Hauge as a very important person. It is very interesting to read the many biographies written about Hauge, but in order to understand the resistance and hatred of contemporary Hauge, one has to read his own books. Was there something that featured Hans Nielsen Hauge and all his books, so it was the authority of God's Word. The books are permeated by Bible titles and Bible references. All he writes is based on his very strong faith in the whole Bible. He is very careful about recommending other books for reading, and he actually warns people against reading these if they are not rooted in the word of God. In his admonition at the end of the same book, Hauge says: "Ask for the enlightenment of the Holy Ghost. If you read other books, so try if it is the true word of God which is written, for there are both books and teachers that make the road wide, and who deceive souls with blessedness sake of hope until they wake up in hell .... "
While he published his first book in 1796, he also printed a small booklet called "Evangelical Living Rules". This is not written by himself, but as Hauge thought was very important. The booklet was later printed and published several times. At the beginning of these "Deliverables," it is said, "Let the Holy Scripture be your faith and the only rule of life. If you read other constructive writings, try all that exists in them according to the word of God, and do not let any human book lead you away from this precious word. " When we retrospectively look back on what the hawk weakened, it was precisely the fundamental belief in God's word that laid the foundation for social change and reformation. It led to people being born again and having their hearts transformed.They got their cause in order with God for time and eternity - which in turn led to social responsibility with honesty and good morality. Humility under the authority of God's Word created a social movement. Hans Nielsen Hauge had complete confidence that God's word with the enlightenment of the Holy Spirit could change people's lives to the best. Haugians were humble, diligent and laborious people who were creating many jobs. The faith in the word of God and the certainty that their sin was forgiven and that they were saved from an eternal hell gave them a new life. It led to creativity, and new businesses were founded with many jobs. Hauges radical and clear message of repentance from sin and follow-up of the word of Jesus sounded badly in the ears of the "world's wise", to use a Hauge expression. At the same time we must understand that God called Hauge at a time when the Enlightenment had made the official proclamation was virtually no gospel provoking force. Hauge therefore became a fire torch in his day to bring the people back into faith in the entire Bible's word and salvation only in Jesus Christ. The rationalist priesthood helped to make Jesus' reconciliation work (suffering and punishment for sin) dimmed and gone. The rebirth and justification were not mentioned. Eternal bliss was preached, but not judgment and destruction. Hauges message despised contemporary rationalists. He believed that human beings had to be reconciled to God through Jesus because man of nature was "inexhaustible to all good." Hauge proclaimed that "man had innate enmity to God," and believed that in order to be saved (saved), one had to first feel "sadness of sin." It is simply not surprising that Hauge gained strong resistance and was hated. He proclaimed the Bible as the only way to salvation of humanity with spirit and power. His Christian message was a total challenge: the body, soul and spirit should under the Spirit of God. Repentance was the entrance to a life transformation that was never allowed to relax. In the book "view of the fact the world's poor" (1796) he writes: "I am expecting many enemies of Satan spiritually possessed people, so be it. If I lose life or all I have, I'm prepared for it-only it happens to God's glory. " Hauge was aware that his radical repentance message could result in his own life. He still refers in his books to the strong persecutions of the first Christians, and where the apostles and many others had to suffer martyrdom. Already in his third book "A Sannheds Confession about Blessed clergy Saw" which came out in 1798, he writes that he is ".. accustomed to strokes, rebellion, honor, dishonor, evil and good reputation, and is accused by several as a fornicator , thieves, drinks and even called devils ". "Fools shouted: Do not talk to Hans Hauge, do not go where he is, because you get mad! Some more scholars in the knowledge of the letter than myself indicated me a middle way. I asked: Where does this middle way go? They could not answer me, but I replied: It's only a narrow way to life, and a wide path to condemnation ... takes someone a middle way, I think it runs in the wide path to hell. " In the book from 1816, "Travels, Key Events and Tributes," he states: "By this time I have expelled 10 arrests, besides this last one lasting the 11th year. Three times been slain, multiple times the lie in honor, good name and reputation. " Nevertheless, he adds in the same section: "God give me the grace to pray for my opponents, and wish them the best self for their unwillingness to me." Hans Nielsen Hauge had no revenge against his persecutors. He followed the word of the Bible to forgive those who hurt him. This proves that the more a person believes and follows the word of true God, the more will forgiveness appear. The long imprisonment that Hauge had to sustain destroyed his health. But when the final judgment falls on Christmas Eve in 1814, he writes in a letter to his friends: "I promise and thank the Lord, exalt and announce his holy name for his unseen grace. He who has called us with the power of His Word and Spirit. He has shown us what is good, which is hidden from those who fear and love Him. " Hans Nielsen Hauge was filled with Jesus' love and a true Christian fundamentalist. As an example, he confirms that the more a human being is faithful to God's word, the more will love dominate and not revenge and retribution. Some of Hauges friends have described his nature. Professor and theologian Johannes Stenersen, who was opposed to Hauge, nevertheless had to admit: "It radiated mercy out of his whole sight, and of his not very big blue eyes, a gentleness and love that could not help but benefit him . He had a very gentleness. "(From his book" The life, business, doctrine and scriptures of Hans Nielsen Hauges "- 1827.) Torleiv Bache from Drammen writes in his remarks to Stenersen in his book of 1828:" His face was kind feel like he was gentle and friendly to all. " "I have obeyed the Spirit of God, and he has helped me to become my faithful faith."